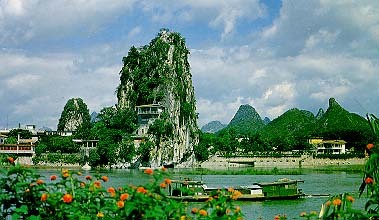 Fubo(wave-subduing) Hill to the northeast of downtown Guilin by the Lijiang River has the Xinxi Marquis Temple built during the Tang Dynasty (618-907). The title of Xinxi Marquis was given to Fubo General Ma Yuan, so the name of the mountain. Half of the graceful lone peak of the hill is in the river and the other half is on land. During flood season turbulent currents explode against the hill rocks. On the top of the hill one sees an exquisite scenery like a traditional Chinese painting. Inside the “Return the Pearl” Cave, also known as Fubo Cave in the mountain side, there are the “Try the Sword” Rock, the 1,000-Buddha Crag (Buddha images carved on stone), and many carvings on the cave walls. Among the best carvings is a self-portrait of Mi Fu, a famous painter, and a poem by Fan Dacheng, a famous poet, both from the Song Dynasty (960-1279).